Two Sunday’s ago, I braved the extreme heat and ventured into the CBD on a Sunday afternoon (not something that I normally do). I’m in the city Monday to Friday so usually I avoid the big smoke on a Sunday. However something drew me into town that day and I reckon it made a beauty of a Sunday afternoon date. If I was posting an Instagram photo of this date it would have the following hashtags; #cocktails #sun #beergarden #streetart #graffiti #DJs #rooftop #burgers #instadating #cleanliving #bestfriendsforever … ok maybe not the last few but you can see it sounds like a pretty sweet Sunday date. First things first, get yourself into town, well very first things first, get yourself a date and then head into town. The starting destination for this date is Trunk Bar & Restaurant at the top end of Exhibition Street. On Sunday afternoons for the next 6 weeks (between 3pm – 7pm), Trunk is hosting The Zoo, a very cool Sunday ‘Safari’ in their very cool beer garden. The day involves street artists painting live, DJ’s, cheap cocktails and tasty snackage. Basically you get to sit in the sun, sip on a $5 Sailor Jerry Perfect Storm, listen to some beats and watch Melbourne’s best street artists do their thang in front of your very own eyes. It’s also a great chance to get up close and personal with the artists. Upcoming artists include Hancock, LucyLucy and Kaff-eine. This is an afternoon date that is different without being ‘too different’. It’s a chilled afternoon of art, cheap cocktails, sun and music… no more needs to be said really. It’s time to move on for something to eat and something more to drink. A match made in rooftop and burger heaven has seen Madam Brussels team up with Huxtaburger on Sunday afternoons. So from Trunk make your way down to Bourke Street, and in the 50 First Dates manner, avoid Exhibition Street and work your way through Punch Lane (off Lonsdale) and Liverpool Street. Maybe you’ll spot some more street art on your travels. By now most people have heard of Madam Brussels, the uber-Melbourne rooftop bar where the staff are dressed up as 80’s tennis players. If not, the trip up to the roof is quiet unique. Head through the door where you see the Spaghetti Tree and take the dodgy lift. 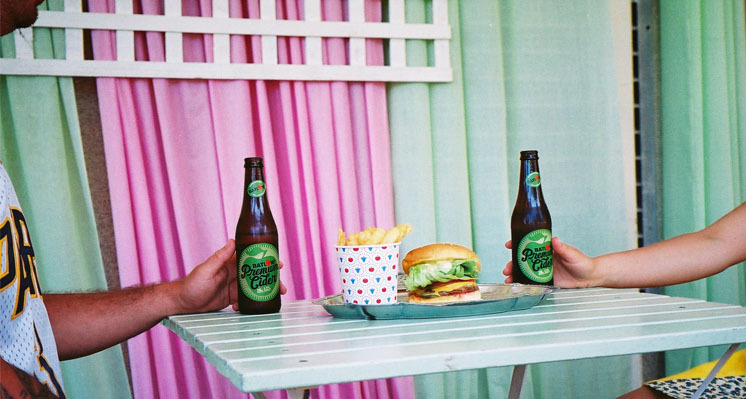 Madam Brussels is a perfect place to take a date, but more so for the next few weeks as on Sunday’s Huxtaburger will be joining them to serve their delicious burgers, coupled with a cider and all for only $15. But make sure to get there between 3pm – 8pm as this is when they will be serving burgers. You seriously couldn’t be doing much better on your date as you’ve teamed up an artist painting live in Melbourne’s coolest beer garden, plus afterwards you have enjoyed Melbourne’s best burgers on Melbourne’s coolest rooftop bar. Wowee, if that doesn’t do it for your date, then I would suggest cutting your losses and getting back on Tinder. Great work on this blog. I believe every city should have a guide to first date ideas. I have embarked on Date #17, Date #9 and will probably do Date #8 soon (it is this time last year you wrote this post, comedy festival). Thanks (can’t find your name anywhere) and keep the first-date ideas coming! Wow the live art would be great!